Overheating in the wiring of a Hotpoint fridge freezer was the probable cause of the Grenfell Tower fire, according to a new report by an electrical fire expert shared at the public enquiry. The author of the report, Dr John Glover, concluded that the blaze most likely started in the Hotpoint FF175BP fridge freezer in the kitchen of flat 16. Based on analysis of a small relay compressor compartment at the bottom rear of the fridge freezer, recovered from the scene, Glover found that the ‘poor crimp connection’ meant that the fridge freezer’s wires were not as tightly gripped as they were supposed to be. This, in turn, is believed to have caused a wire connector to overheat. The initial fire quickly spread, eventually engulfing the tower and killing 72 people. Owners of the Hotpoint FF175BP fridge freezer were advised to continue using the appliance, after a separate independent investigation in May 2018 found it posed a ‘low risk’. The same advice currently applies to owners of the grey Hotpoint FF175BG (pictured above, left), which was not involved in the Grenfell tower fire, but is a colour variant of the FF175BP. Both models fully complied with all legal, safety and regulatory requirements that were in place between 2006 and 2009, when they were being manufactured. As part of the inquiry, Dr Glover also highlighted how the backing of refrigeration appliances can influence the spread of fire. 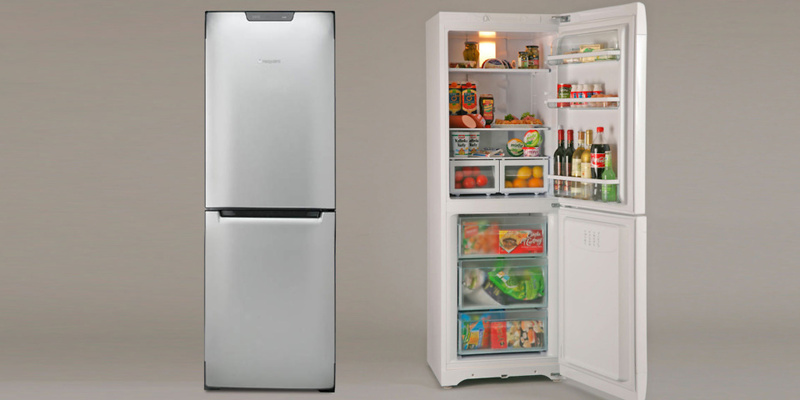 While fridges, freezers and fridge freezers produced in the US must have metallic steel backing, models made in the UK and Europe can have plastic backing. Dr Glover said: ‘That metallic backing would help to contain an internal fire, keep it inside the refrigerator, for a long time. Which? tests have revealed that plastic backing is highly flammable compared with aluminium laminate and metal. We are therefore not recommending any refrigeration appliances with flammable plastic backing. All these fridge freezers have been made Don’t Buys, regardless of how else they performed in our chilling and freezing tests. The Hotpoint FF175BP and Hotpoint FF175BG were not part of our investigation, as they were discontinued in 2009. Alex Neill, Which? managing director of home products and aervices, said: ‘The claims from this inquiry backup our own findings, which show that plastic backed fridges and freezers put lives at risk by contributing to a fire spreading more quickly. ‘These findings raise real questions around why people in the US, where these appliances are banned, are better protected than those here in the UK and Europe. Whirlpool, which owns the Hotpoint brand, told us that it is committed to assisting the Grenfell Tower Inquiry in any way it can. It said that nothing matters to it more than people’s safety and that owners of the FF175BG and FF175BP models can be reassured that these products are safe to continue using as normal. Whirlpool also indicated that two other investigations, one by the Department for Business, energy and Industrial Strategy (BEIS), and another by Whirlpool, both found no evidence of any fault with this model and confirmed that it fully complied with all safety requirements.